As part of exploring South Texas Politics, I had the opportunity to visit with outgoing District 43 Texas State Rep. Jose Aliseda in Beeville just before the Bee County Republican Round-Up. Aliseda is a great public servant. 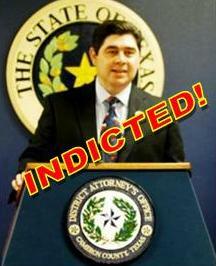 He has served the people of Bee County as County Attorney and County Judge. He has also served the people of Texas as a State Representative and a member of the Texas Board of Pardons and Paroles. As he is running unopposed, he will also serve Bee County next year as the new District Attorney. All this to say, it is no small thing that this servant of the people has endorsed Adela Garza in her race to be the first Congressional Representative for the newly created 34th Congressional District. In the video interview below, I sat down with Adela Garza and Jose Aliseda to talk about this part of the district and issues that its voters are facing. Aliseda told me he endorsed Garza because of her qualifications and her service to the community. He expressed concern, that in the past, the northern part of the district had remained pretty much un-represented as it was ignored by previous Congressional Representatives from the southern part of the district. I have noticed that you can predict how a representative will interact with people after they are elected by watching how they interact with voters during the campaign. During the Bee County Republican Round-up, I observed Garza "working the room". In other words, she spent the evening going around from table to table, talking with the voters and connecting with them to learn what was important to them. Contrast that with one of her opponents, who spent almost the entire evening sitting at her table with her campaign team and hardly speaking with anyone. She then ducked out early, whereas Garza was one of the last to leave and then went on to have more discussions with local leaders about district issues. That is what representation is about. Garza, Aliseda and I discussed energy issues which are providing a current economic boom to this area as part of the Eagle Ford Shale project. We also discussed border security, illegal immigration and the impact of the Republican Party of Texas' Platform document has had on reaching out to conservative Hispanic voters in South Texas. With the state party convention right around the corner, it is important to understand that what we are saying can be completely overturned by how we are expressing it. There is much to change in this year's platform. We also discussed the impact of HCR 88, an initiative supported by Rep. Aliseda that took a unique and positive approach to border security, illegal immigration, education and jobs. An initiative to create a Republican originated "Dream Act" that involves military service for those seeking to earn citizenship. This program addresses the creation of a legal status for law abiding people who were brought to this country, through no fault of their own, as children. After this interview concluded, I went on to have a more in-depth discussion with Garza about her race for the Republican nomination for CD-34. With this week's indictment of one of her Democrat opponents, current Cameron County District Attorney Armando Villalobos, it is important for the voters of CD-34 to see they have a lot of choices available to them for representation. The Republican party has a tremendous opportunity to extend its reach into South Texas. We will continue to look at this further. Texas GOPVote blogger Bob Price: Representative Aliseda, I'd like to thank you for your service to the people of Texas. We are here in Beeville in your office today, and I understand that you have been a county attorney, county judge, served on the Texas parole ward I believe, and were freshman of the year last year in the Texas legislature. So you have a strong history of service to the people of Texas, and we greatly appreciate that, and today we here to talk about Adela Garza. Thank you for your hospitality here in welcoming us to Beeville and the newly formed 34th congressional district, and it's exciting that we have this new representation here in Texas. So if you could tell us a little bit about this part of the district, and I understand you have endorsed Mrs. Garza. State Rep. Jose Aliseda: Yes, I have endorsed Adela. I did several months ago. I thought she was the best of the three candidates running, mainly because I believe she is the most qualified, she is a conservative, she has been a Republican for a long time, she is currently serving on the College Board of Trustees in the Valley, and we need people that are experienced and that know how to move around in government, and I think she is the one. The other two candidates don't have her experience and qualifications, so that's why I endorsed her, but as far as the district, the part that I represent is about three or four counties in her new district. And they're rural South Texas districts, and they have a different demographic than where she's from, which is the Valley, but the weight of the population of the district is in the Valley, so I'm hoping with her, with me having some contact with her, that she will understand that we appear, up here in the North, that we exist, and that we are not going to be neglected as we have been with our current representation with congressman Hinojosa. Bob Price: And congressman Hinojosa is from down in the Valley? Jose Aliseda: He's from Hidlago County area yes. Bob Price: And the district, I believes, runs from just North of here, Northwest of here. Jose Aliseda: Almost actually to San Antonio, Gonzales County, part of Gonzales County all the way down to the Valley. I don't know how many miles that is, but it's long, here in the north we call those fajita strip districts, because if you look at a map, they're all stretched from the South to the North and it was in order to comply with the voting rights act, that the districts had to be formed that way. Bob Price: I grew up in Rockport, not very far from here and I understand how those long districts and the smaller parts of the district like this can end up being underrepresented because of the weight of the population in the other part. In Rockport, we ended up being represented by someone from Houston or Galveston most of the time instead of what would have been more logical at the time, Corpus Christi. Jose Aliseda: About 3/5ths of the population for his district lives in the valley, so yes, and the valley has a completely different demographic than the Northern end of the district. Bob Price: So what is the district like in this part of the state? Adela Garza: It's very diverse but, and you're talking about, culturally? Bob Price: Yes, and business and demographics. CD-34 Candidate Adela Garza: It is so so different from the Valley because it is so spread out. We are used to block walking at home, and it is do difficult to get together a group of people to block walk anywhere, so it has been difficult to bring them all together because it is so different than the Valley. And they are so eager to be represented by somebody, but also this is the first time that they feel that they have a say so they are being very careful who they choose to represent them, and I don't blame them, I feel the same way. We were not the majority when we were represented by former congressmen, and you kind of want to have that open door, and it didn't happen, and I understand. Bob Price: Tell the readers of TexasGOPVote a little bit about your background and why you want to be the congressperson representing, and I understand that you worked with Blake Farenthold as well. Adela Garza: I have lived in my district for 36 years, and I started serving about 30 years ago, and you start with the school board and then the irrigation district, and you move on like that, and you learn how to work with people, and how to work with government agencies, and its a progression, and when I worked for congressman Farenthold , and I came to work for him because I helped him in his campaign. I had the effort to change our congressman because we were tired of being underrepresented, and we chose Congressman Farenthold because he won the primary. I didn't know him. He came and asked for help and we agreed. Mr. David Polina and I decided we were going to change our congressman, and we were very lucky that we did. Adela Garza: And everyone thought that we were crazy, and we kept hearing it, you guys are crazy, but we knew that if we continued and we worked really really hard that we could make a difference. And when that happened Congressman Farenthold said, you know, how would you like to work for me? And I have been kind of semi-retired. I just run my business, but I thought it would be a wonderful opportunity for me to represent my people, and my district. And I did that, and it was a very very rewarding experience, and I don't regret it at all. My only regret was that I had to step down to run for this position. Bob Price: Now one of the things that the courts argued in our drawn out primary system caused by the chaos in the courts in San Antonio is that Republicans couldn't elect a Hispanic to represent a Hispanic district. Clearly you are here and you are the front runner in this race and did a great job of representing the people of this district. One of the things I have found with my business dealings with the people of the valley is that there really is a conservative base down there for a Democrat label, but they really are conservative people in their values and their nature. Adela Garza: You know, I've found out because I have run non-partisan races and I have been elected by Democrats and Republicans and I think that is the advantage that I have in this race. Is that, you have to have a very broad base in Cameron County, and I have that. My last election for the trustee of the community college I got over 3000 votes, and that was one third of the county, three school districts. So I have crossover vote, and that is an advantage that I have. Other than being a small business owner, my house is in order, I am financially stable, my kids have graduated, I don't have little ones in the house, and being a congressperson is a difficult job. I saw it with my former boss. He slept at home maybe twice a month, and that was a lot. So it takes a lot of commitment and you really have to pretty much be free of a job, your kids, a family, and so, I think that is the advantage that I have too. Bob Price: Last session, when you were in the State House, the Republican Hispanic Conference pushed a proposal through called HCR88 about immigration reform and border security, can you talk a little bit about that and give your reactions to that premise on a national level? Jose Aliseda: Well, I think that came out of frustration that out immigration system seems broken. You know for example I am an immigrant, I came to this country, I waited in line to come to this country, to become a citizen. I came at the age of four, I came as a legal, I came over legally and waited until I was 17 to become a citizen. It seems as though those who are following the rules are getting pushed to the back of the line, which isn't the way things are supposed to work. The other frustration is that the federal government is not doing anything about securing our borders, and that's a frustration for our entire country because they feel, and I think John Mccain was right on this issue which was, close the border, let's see who's here and let's see what we can do humanely. And that was part of HCR88, and one of the other things we helped push was, I would call it the Dream Act, the military Dream Act, and that is if individuals were brought over to this country as youngsters, unbeknownst, or because their parents brought them over, if they have assimilated and they want to join the military, and serve honorably for a few years then they should be looked at for citizenship. And we kind of had a similar program with Filipinos that were able to join the military, serve, and then become US citizens. Personally I believe that is a better Dream Act than what the Democrats propose which is you go to college, which is not a hardship by any means, especially when you are going on the taxpayer dollar, and somehow making that the equivalent of military service. I have served in the military. I did four and a half years, actually five years, in the United States Navy, so I know what a hardship military service is. Bob Price: I notice a picture in your reception area of, is that your son with General Petraeus? Jose Aliseda: That is my son and he served honorably and so did, I have another boy in Korea right now, and that was my son's re-enlistment with General Petraeus. I've tried to push my kids into the military, I think it is a great start for anybody. Bob Price: It is a great place to learn and find out a little bit about who you are. As a Congresswoman, how would you address the issue of border security and immigration reform? Adela Garza: These are two separate issues. I think we need to secure the border first, and I believe we need boots on the ground. We need to secure our borders before we even start talking about immigration because they are different things, and I live in the Valley, I know that no matter how much they tell us our borders are secure, they are not. I have some property, and I have a shed, and frequently we have to change the doors and the widows because illegal aliens come and occupy your property and they destroy your property, and as long as our borders are not secure we are going to continue to have that problem, and I feel for the ranchers, their fences are broken, and sometimes cattle are killed for one meal. Bob Price: I understand that where it used to be that when they used to cross they didn't do damage to the fences and those kind of things, but recently that has escalated, and it is almost malicious in the effort to turn the cattle loose on the road to distract law enforcement so that they can work the smuggling on through there. Jose Aliseda: Well there is more than just human smuggling. You are having so many things come across that border, your having drugs, prostitution, its lawlessness, and you know, the federal government in Washington just turns the other way. And I think they do that on purpose because I think they want to overwhelm the system to the point that Americans just throw up their hands in frustration and accept whatever. And to a certain extent I think it has worked. We have kind of become jaded. Jose Aliseda: Let her sleep on a tent on a ranch and see if she isn't scared to death. Adela Garza: You know when we build a border there is land on the other side. When we build a fence there is land on the other side, and the people that live on this side of the fence, they are still in the United States, and there is no law officer that is going to go out there at night. They are left unprotected, and it is scary. I would like to invite her to spend the night in that house right there. Bob Price: I think she would probably bring an army with her. Adela Garza: And she would have to, you know it's amazing how when they irrigate at night, it used to be they spent, workers spent all night irrigating. They don't do that anymore. Jose Aliseda: The government has its priorities, we have to have the catholic Church provide contraception and abortions (Jokingly). Bob Price: Now tonight in Bee County we are having a Republican round-up. Now, when I grew up in South Texas, there was no such thing as a Republican party. My first campaign I worked for Hank Grover for governor down here and there were literally no Republicans and now you have a full activity going on down here. It's quite a development. Jose Aliseda: Well we have changed, the economy has changed, when I first ran as a Republican back in 92' it was myself and one other Republican official, and now we basically control the courthouse. We have district court that is Republican, Texas collectives, Republican, the county judge that is Republican, two commissioners that are Republicans, and a lot of those are Hispanics. The word Republican used to be a four letter word here, and if you go further North there are a lot of counties that are a lot like us, and to certain extent its happening down in the valley, and I'm hoping that Adela is going to break some ground down there as the first Republican Hispanic female from the Valley. That would be fantastic. Bob Price: Well, I know that representative Aaron Peña did a great job for us in breaking some ground down there and showing people that Republicans could do a good job to represent the Valley and the district down there. Adela Garza: I remember my first race supporting the first Republican county judge and his last name was Garza, same as mine was, and everyone thought we were related, his name was Tony Garza. He later became ambassador to Mexico from the United States, but I remember walking the streets, and block walking for him, and it was our first Republican county Judge. Bob Price: And they have a county Hispanic Republican judge now is that not right? Adela Garza: Yes, and it is funny how it goes back, you know, you work really, really hard and then it goes back. So from Republican it went back to Democrats, and we had to pick up or speed and work really hard again and it went back again to another Republican county judge, but it takes a lot of work and we are making strides every year, and that's why I knew that we could get congressman Farenthold elected. We didn't need to win Cameron county, we just needed to up the numbers, and we did that. And that night was sweet, it was really, really sweet. Jose Aliseda: Now something sad that happens and it's a common on the media is that, you know, I went with Adela on Univision in Austin, and the lead up to her interview was how horrible Republican were. And Univision is routinely bashing Republicans as being anti-immigrant. What they fail to say is that Republicans are pro-immigration, they are just anti-illegal immigration. And they equate the two, and it's not to be equated. And it's frustrating when part of the reason we have this bench mob mentality with Treyvon Martin is because blacks have been told for the longest time that they have been persecuted, and that changes their mindset to the point where they can't except, or they can't see the world in a different way, and I think that's what happening unfortunately to Hispanics that watch Spanish language news. Bob Price: And we as Republican have to be very careful about that as well. We have the Republican State convention coming up in a few weeks, about six or eight weeks now, in Fort Worth, and I think that we are going to have the opportunity there to reshape the language of the platform to make it less divisive. The wording in the last platform was extremely hostile and the people like the Democrats and Univision used that against us a lot when people actually like you were working very hard to establish a lot of Hispanic outreach for Republicans to secure those values and conservative issues that they represent. Adela Garza: I remember the last convention my daughter was on the platform committee and they had this interest, but my daughter and another attorney said this is not what we want. This is the language that we should stay away from because it is very, very, I don't want to say harsh on immigrants, and they don't differentiate really. Adela Garza: Yes, that's the word. Bob Price: So we are going to work on fixing that this time. Jose Aliseda: The problem is that there is such frustration with the federal government that's not doing anything about border security that people feel threatened so they respond with their own harsh language. And that's the problem, I think that if the federal government would do a lot to secure the border as Adela said, then I think people would be a lot more accepting of a less harsh reform. Bob Price: And I don't know what positions Hinojosa was on those positions, but no matter what his positions were, but as a Democrat congressman his first obligation was to support Nancy Pelosi and her agenda. Jose Aliseda: And that's part of the problem up here with which our counties up here in the North are so frustrated, he doesn't even vote his counties in the valley to be honest with you, he doesn't vote their values. You know the values of this district, of Adela's district, of the fajita strip districts are pro-life, and he never voted pro-life, pro-business, and he never voted pro-business, which is the way that the Democrats, he voted the Democrat party line which is Anti Adela's district and what it has been here for a long time, Anti South Texas. Bob Price: Well thank you again for your service to Texas and to our Nation, and thank you for the sacrifices that you are making. One of the things that I have learned this election season is that when someone declares for office, it is a tremendous sacrifice and I appreciate you taking the effort to go out and do that. We will talk some more about your campaign and what your views are on the issues for your district. Adela Garza: Thank you for being here, I appreciate you.